Nothing like the disembodied head of a doughy white guy named "Daddy Jim" to pique your appetite. 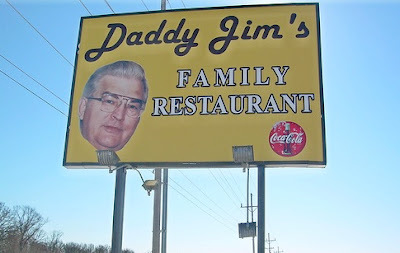 For some reason, Daddy Jim's floating head reminded me of this album cover, also courtesy of a derivative of James. Should you ever run into a slow news day on the Gallery, I'd like to see you have some fun (or, if you prefer, "fun") with this.